Premise: A professional who specializes in "career transition counseling" is on the verge of accumulating 5 million frequent flier miles. About: Based on the novel by Walter Kirn, this was adpated and is being directed by Jason Reitman (Juno) for a release later this year. It will star George Clooney, Jason Bateman, and Vera Farmiga. The script was a hot property last year when Leonardo DiCaprio got attached and it later landed on the Black List. Because Reitman is both the writer and director, there's a good chance this draft stayed relatively intact. I put this one off because I'm the anti-frequent flier. I fly once or twice a year and I hate every second of it. I'm kinda fascinated by these people who spend their entire lives on airplanes, in rented cars, in hotel rooms, because I always ask myself: What are they running from? Clearly, if they liked their lives, they'd be home more, right? 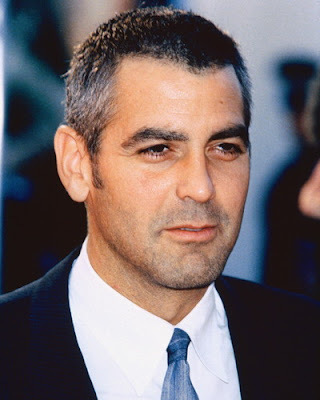 That seems to be the inspiration behind the character of Ryan, played by George Clooney. Ryan is a man so appalled by the notion of "home", he couldn't tell you his address if you spotted him the first three numbers. Ryan's priority is and always has been his work. Companies hire him to come in and do their housecleaning. And Ryan, who has the process down to a science, can fire 30 people in a day and not bat an eye. It's not that he's cruel. He genuinely cares about these people and their futures. But he loves the wonderful lifestyle this always-on-the-move job provides him. Ryan is perpetually 33,000 feet above you, me, and everyone else. Recently, Ryan's found himself approaching the 5,000,000 mile frequent flier mark. Only 7 people in history have ever achieved it at the airline and Ryan's about to become the 8th. Reaching this point gets you ridiculous perks like your name on a plane and the kind of celebrity treatment reserved only for - well, for celebrities. Ryan purchases nothing or does nothing unless it increases this ever-escalating total of miles. Unfortunately, Ryan's high flying lifestyle is about to make a ditch landing in the Hudson River. A brash attractive 23 year old Ivy-League grad named Natalie is hired by the company to do some cost-cutting. And Natalie comes up with a doozie. Instead of *going* to these companies to fire people, what if they could do it over video chat? Ryan is outraged by even the mention of such a practice, but his boss likes Natalie's out-of-the-box thinking and before Ryan knows it, he's scheduled Natalie to follow Ryan around the country for a few weeks so she can learn firsthand how to fire people. Ryan's perfect "on-the-move" lifestyle and 5,000,000 mile achievement is about to be crushed by some ignorant 23 year old Ivy League ditz. In the coming weeks Ryan and Natalie try their best to work together but they're the exact opposite in every way. She hates being away from home and is eagerly anticipating her marriage. He hates being *at* home and is eagerly anticipating the day she's not around. And no, this isn't a Hollywood romantic comedy so you can forget about the two hooking up. Instead, the story focuses on the unlikely friendship that forms between them. They find that they do actually have one thing in common - they're both lost souls. And no matter how much sense their current philosophies on life seem to make for them, they're both afraid that they're missing out on something else. One of the better subplots of the script is Alex, the female version of Ryan, who meets up with him all over the country for layover bootie-calls. The two know very little about each other other than that they love the thrill of being on the move. Whereas Ryan and Natalie rarely agree on anything, Ryan and Alex agree on pretty much everything. It's the ultimate no-attachments relationship. When a family wedding starts pulling Ryan back to that ugly cloud of attachent he's worked so hard to avoid in life, and Natalie's words start to give him a new perspective on settling down, Ryan finally sees what everybody has known about him forever: That the 20 years he's spent running around the country were less about embracing life and more about avoiding it. He finally understands what he's missing and to prove it, he jumps on a plane and flies to Alex's hometown to surprise her. He wants that commitment. But when he gets there and she opens the door, let's just say he experiences some turbulence. And that's what I liked most about "Up In The Air." There's no flight plan. And you're never quite sure what city you're going to land in. I'll be honest. I expected to hate thing thing. Who cares if someone gets 5,000,000 frequent flier miles?? Thankfully, that whole schtick is more of a story hook than something that actually plays into the plot. The script is more about drifting and our obsession with distraction. It's about growing up, the power of denial, is the grass really greener on the other side? It's about selfishness and family and never knowing if you're making the right choice. Up In the Air really won me over in the end. It's not perfect. It drifts a little. But in a weird way, the drifting mirrors Ryan's life, so it kind of works. It reminded me of a more serious Jerry McGuire - and I think Cruise would've been a better fit than both DiCaprio or Clooney. But if Clooney can pull this off, he may be up for some awards come Oscar time (it shouldn't be hard. How many nominations do they have now? 30?) This is the film that "The Terminal" wanted to be and one of my most anticipated flicks of the winter. What I learned: Is 110 the new 120? - Up In The Air may clock in at 124 pages but that's because Jason Reitman only has to impress himself. I have been seeing so many 100-110 page spec scripts lately. It's so rare that one of the chunkier ones sneaks through that you begin to wonder if 120 is becoming the screenplay equivalent of standard definition. Of course, thrillers and comedies are naturally shorter. If you're writing a drama, you can eek into 110+ territory. But I'd still look to keep it under 110. Readers are just used to it. And after being yelled at and ridiculed for 9 hours, these poor souls have to go home and read 3 professional scripts before they reach yours - the unknown writer - the one script they've been dreading and the one they know if they don't like by page 20, they're getting some shuteye. So don't give them a reason to tune out before they've tuned in.